Start your stag party in awesome style! Begin Your Stag Weekend in Style! As soon as your plane touches the tarmac at Barcelona airport, you’ll want to get the party started! You will have all the essentials in tow; t-shirts, party hats and everything else you need for an incredible stag do in Barcelona! 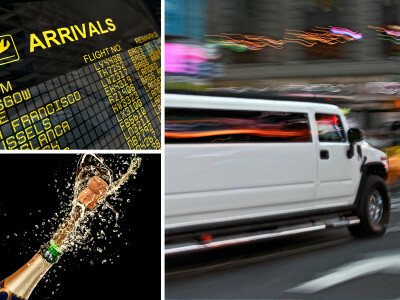 With the hummer airport pickup, you can get the wheels of your party turning in style; the hummer airport pickup gives you the ultimate BIG vehicle to get your BIG weekend going! There will be plenty of space for your group of up to 12 people, who can enjoy a bottle of authentic Catalan cava on the trip to your accommodation.